I want you to imagine a dinosaur. What image pops into your head? Something out of 'Jurassic Park'? Maybe a creature from the BBCs 'Walking with Dinosaurs'. Dinosaurs are ubiquitous in popular culture but no matter where you encounter them they tend to look pretty similar. You'll get scaly skin, drab colours and the same body types and prominent features right across the dinosaur spectrum. 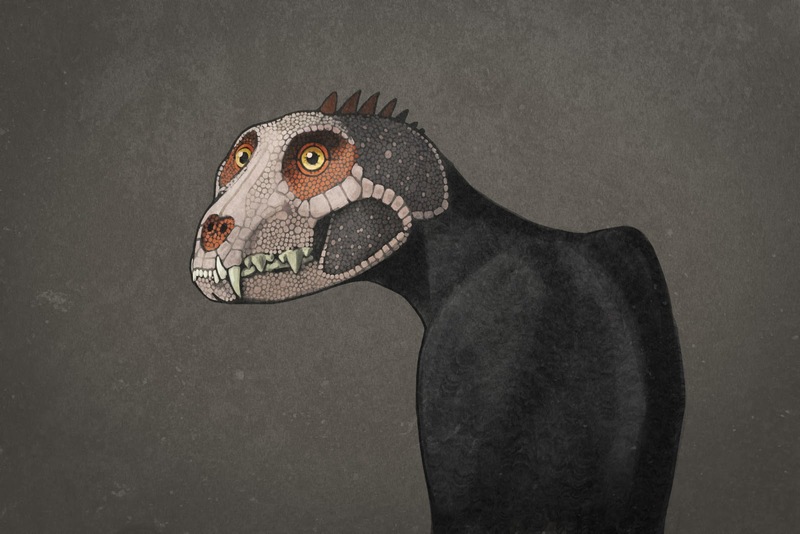 These images of dinosaurs are so pervasive that you'd be forgiven for assuming that a scientific consensus had been reached on what dinosaurs looked like. What was argued at Conway Hall last night is that this assumption is almost certainly wrong. We can never really know what dinosaurs would have looked like, and popular images of them we have are very conservatively imagined. Speakers Darren Naish, John Conway and C.M. Kosemen are kicking back against this conservatism and imagining the wilder possibilities of dinosaur behaviour and appearance. To this end they've put together a fantastic book; 'All Yesterdays: Unique and Speculative Views of Dinosaurs and Other Prehistoric Mammals'. 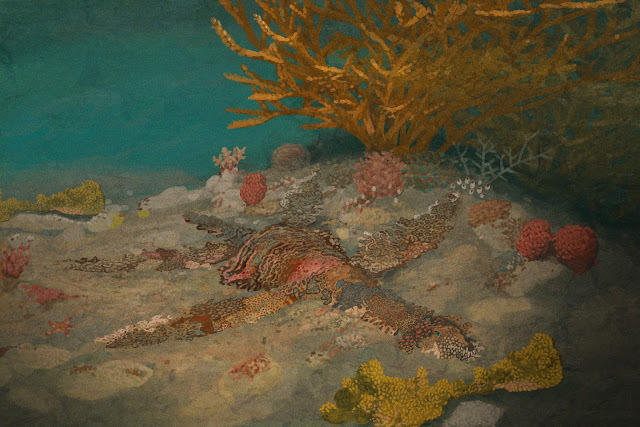 A camouflaged plesiosaur waiting for prey to drift by. By John Conway. The book is a collection of amazing looking paleo art that explores more radical and experimental ideas in paleontology. 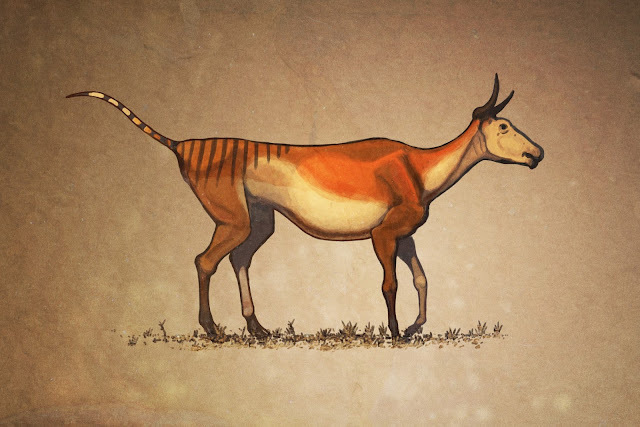 Understandably, most paleo art focuses on making the skeletons prominent in the drawings. But what of the masses of soft tissue around the animals? 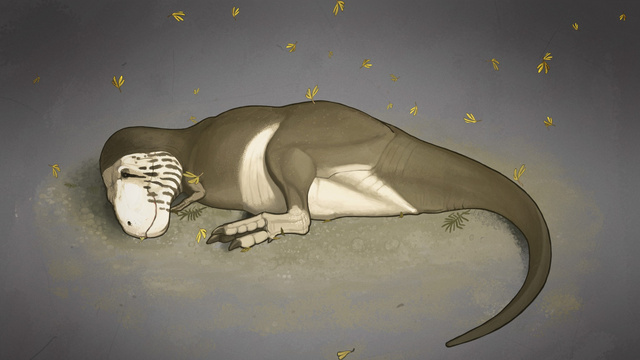 Could dinosaurs have had their skeletons buried deep within round fatty bodies? Could they have had large soft tissue frills or even enormously outsized genitalias? The first speaker of the night was Darren Naish, paleontologist and author of the endlessly informative blog 'Tetrapod Zoology'. 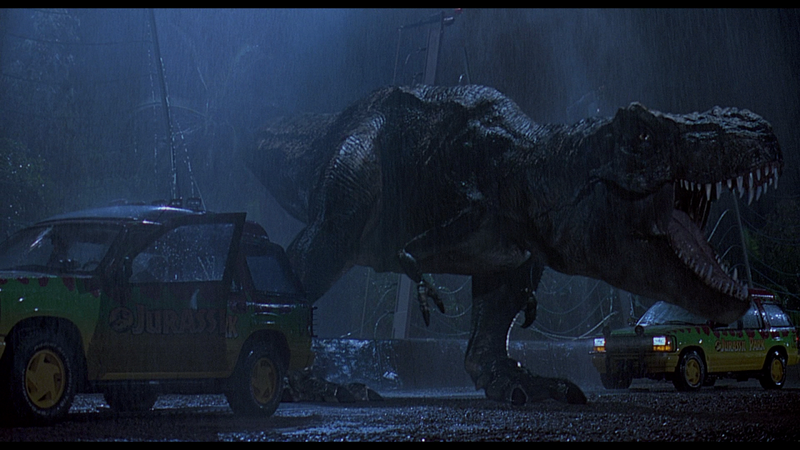 Firstly he gives us a grounding in why we shouldn't be conservative when it comes to dinosaur reconstructions. He shows us a variety of animals in nature that in his words "look freakin' ridiculous". We're acclimatised to seeing living animals with ridiculous body features, so why do we react with giggles when we see dinosaurs depicted in this fashion? Much of this talk is concerned with a speedy run down of the history of paleo art. The first depictions of dinosaurs appeared in the Victorian era of paleontology, where they were depicted as slow, ponderous lumbering brutes, giant lizards so ungainly it seemed no wonder they'd gone extinct. 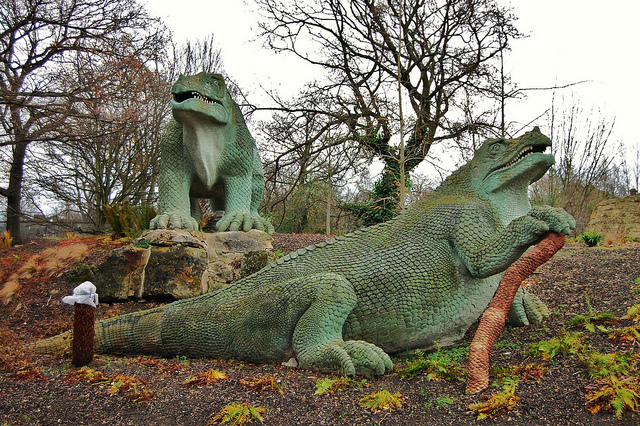 My favourite example of these kinds of dinosaurs are the models at Crystal Palace. If you get a chance do the dinosaur audio tour when you're at Crystal Palace, it's great. As Naish points out, while these dinosaurs are way off the mark based on what we now know we have to bear in mind that these were constructed from very incomplete fossils and actually have a lot of nuance and intelligence in their poses. They may lazily slouch along the ground, but at least they're being lazy in a vaguely anatomically correct manner. On some level these Victorian dinosaurs reflect an over-literalisation of Darwin's concept of the 'survival of the fittest'. The thinking goes, if these animals aren't here any more, then by definition they must have been 'unfit' to live. As more fossils were discovered, the depiction of dinosaurs began to evolve. It's these images from the 1920s and 30s that colour much of the 20th century's perception of what a dinosaur is. Charles Knight was one of the leaders of this field, and though his paintings are wildly inaccurate they remain beautiful in their own right. These depictions echo right through popular culture, through classics like 'King Kong' (1933) and 'Godzilla' (1954) to various 60s dinosaur v cavegirl b-schlock. You still occasionally see the remnants of this poking up in crappy children's toys, comics and cartoons. The next major shift came with Robert Bakker and his quick, speedy, smart dinosaurs. This injection of life began to revolutionise the way people envisaged dinosaur behaviour, and therapods in particular began being assigned bird like qualities. At the same time skeletal analysis of sauropods and other large dinosaurs was leading to changes in opinion how these dinosaurs must have moved, grown and lived. As far as popular culture is concerned, these Bakker style dinosaurs made their debut in Steven Spielberg's 'Jurassic Park'. Yes the film is scientifically out of date, but it still owns bones. That was 20 years ago though, and in the interim period many new discoveries have been made. It's been conclusively established that dromaeosaurid therapods were feathered, and we're now discovering that even larger dinosaurs like ceratopsians had wiry and bristly hair-like structures running down the middle of their backs. These discoveries make it an exciting time for dinosaur illustration, the doors are wide open for paleo artists to use their full imagination while remaining within the realms of plausibility. 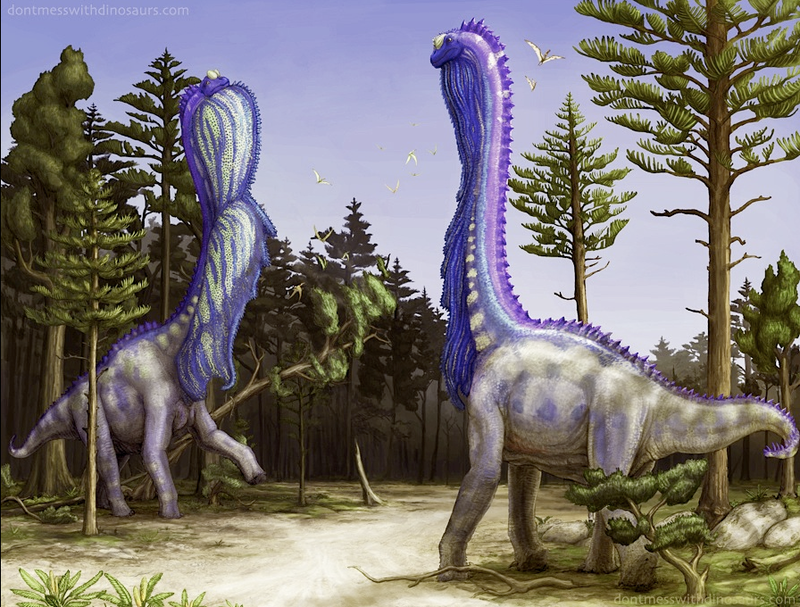 Fantastically coloured like this Majungasaurus crenatissiumus by C.M. Kosemen, showing off it's lovely wattles. I agree wholeheartedly with the speakers when they explain that we should be more imaginative when envisioning dinosaurs and other extinct animals. The underlying philosophy of these illustrations is to make clear that there are things we will never know about dinosaurs. 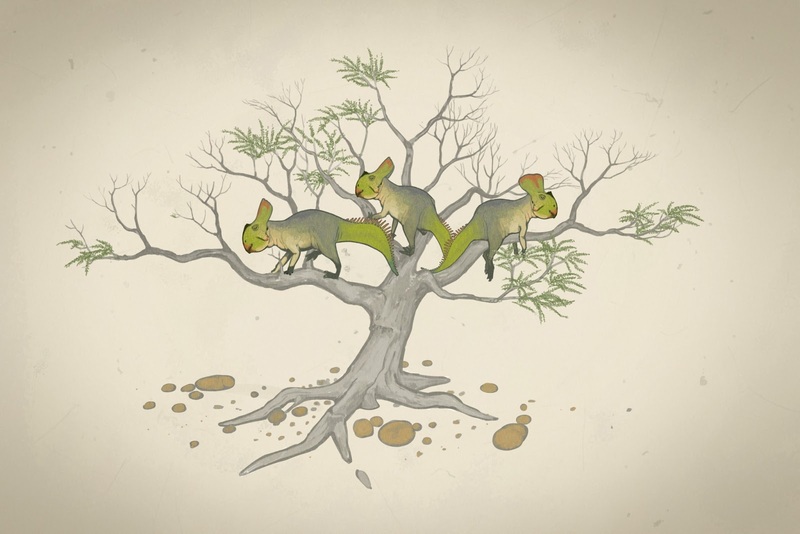 The science of paleontology can rule out some things, but even this leaves a vast spectrum of possibilitie and allows us to conduct thought experiments about dinosaur behaviour that can lead to great ideas like the tree-climbing Protoceratops seen below. The rationale for this is quite brilliant, we know goats can climb trees yet there would be no way of knowing this based on skeletal analysis. So why should we speculate that some dinosaurs may have behaved the same way? I don't know who the audience were at tonight's talk, but they seemed like a pretty up-to-speed bunch. What I found interesting was the reaction when they saw some of the more wildly conceptualised paleo art: laughter. But why is art like this funny? We wouldn't laugh at a picture of a peacock, or at an elephant's trunk, yet it's these kinds of complicated and unlikely soft tissue formations that seem funny when placed on a dinosaur. Many people become dinosaur enthusiasts as children, and grow up imagining dinosaurs a certain way. It can be difficult to accept that those beloved old books and illustrations were wrong, particularly when you have an emotional attachment to them. I asked a question at the end of the night as to whether there is any resistance from publishers towards depictions of feathered dinosaurs. Artist Luis Rey, sitting in the audience told us that he gets requests to get rid of feathers, but refuses to comply. 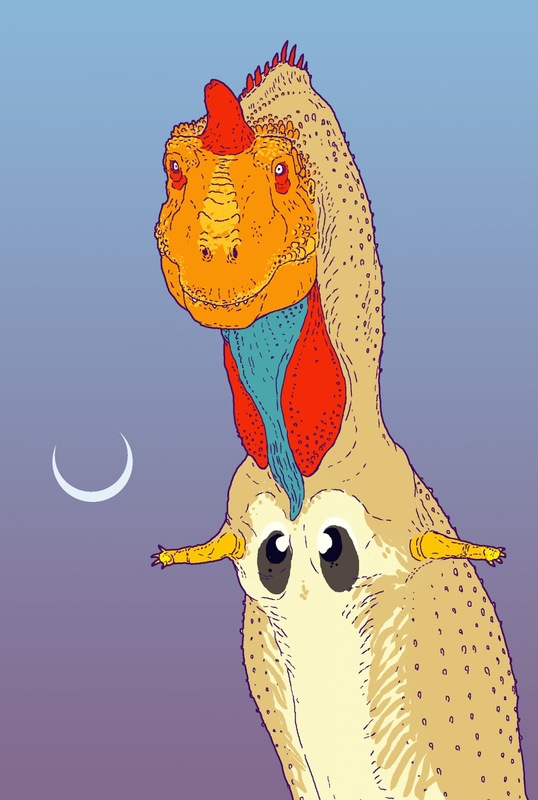 It's a noble stance to take, if a generation of dinosaur-crazy children grow up with feathered dinosaurs fixed in their minds as the standard model, paleo art will have taken a step forwards. But sometime soon there must be another leap forward in popular culture, just as 'Jurassic Park' popularised the intelligent, fast-moving dinosaur, something will soon popularise the feathered, extravagantly coloured contemporary ideas about dinosaur appearance. What the pictures and ideas presented tonight demonstrated is that what we think of as a 'dinosaur' is remarkably plastic. You would think that the more information we can glean from fossilised skeletons and impressions of dinosaur footprints the more we could narrow down a consensus on what these creatures looked like. The opposite seems true. The more we learn, the greater the possibilities. One of my favourite parts of the night was when were shown how a paleontologist might interpret the skeleton of a cat or a cow if they treated it in the same manner as they would a reconstruction from a dinosaur fossil. 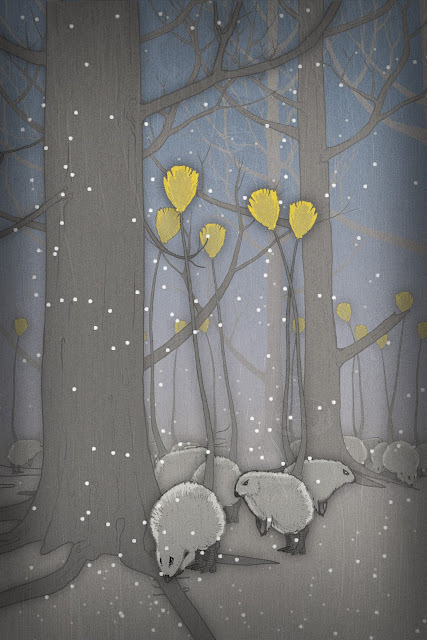 The animals are almost unrecognisable, looking emaciated and, as Naish put it, zombie-like. John Conway's 'reconstruction' of a cow, based on its skeleton. A domestic cat, 'reconstructed' from its skeleton - John Conway again. Seeing dinosaurs presented like this can seem heretical, like the nobility has been drained from these animals. On some level, we've been culturally attuned to want animals like T-Rex to be fearsome looking scaly monsters, and when confronted with one covered in fluffy down we find it instinctively ridiculous. But what work like this underlines is that dinosaurs are not monsters, they're animals. 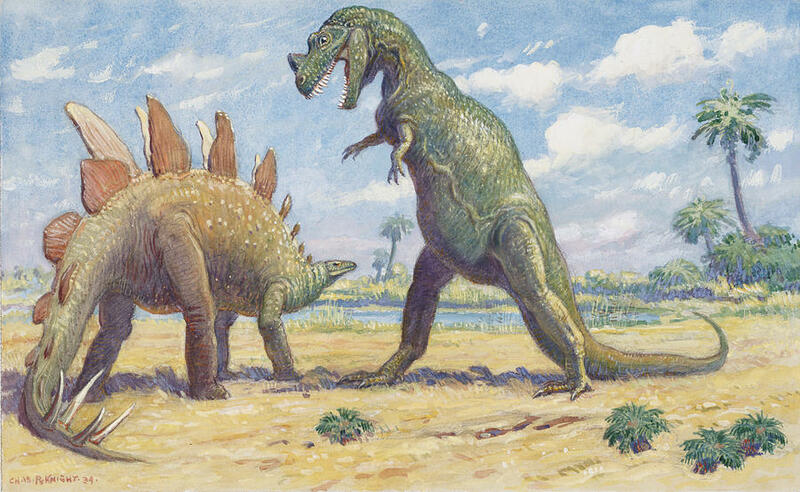 A point made early in the night was that whenever we see illustrations of dinosaurs they're generally engaged in violence, killing, eating or fighting one another. It's understandable that we should want to see these creatures doing exciting, dynamic actions, but there should also be room to see them playing, sleeping or copulating. It's important to note that all of the ideas put forward are entirely speculative. These pictures are giving us an window into the past, just showing how they might have been. In an age of CG reconstructions that purport to show dinosaurs "as they were", it's important to remember that we could be wildly wrong about nearly everything about a dinosaur's appearance. A dinosaur enthusiast time traveller heading back to the late Cretaceous period might not recognise any of the animals he'd encounter. I deeply enjoy thinking about these "unknown unknowns", and pieces of art like the ones shown tonight help visualise the fantastical, alien and deeply weird world of the past. Fat, downy and tufted Leaellynasaura by John Conway. I love this picture. 'All Yesterdays: Unique and Speculative Views of Dinosaurs and Other Prehistoric Mammals' is on sale from Amazon on Kindle and in print from Lulu. Would make a great Christmas present.